Lead Poisoning Nightmare In Nigeria May Be Easing : Shots - Health News Four years ago, hundreds of children died, exposed to lead dust that was everywhere, created in a rush to process ore for gold. Nigeria is finding its own path to curb that dust — and save kids. 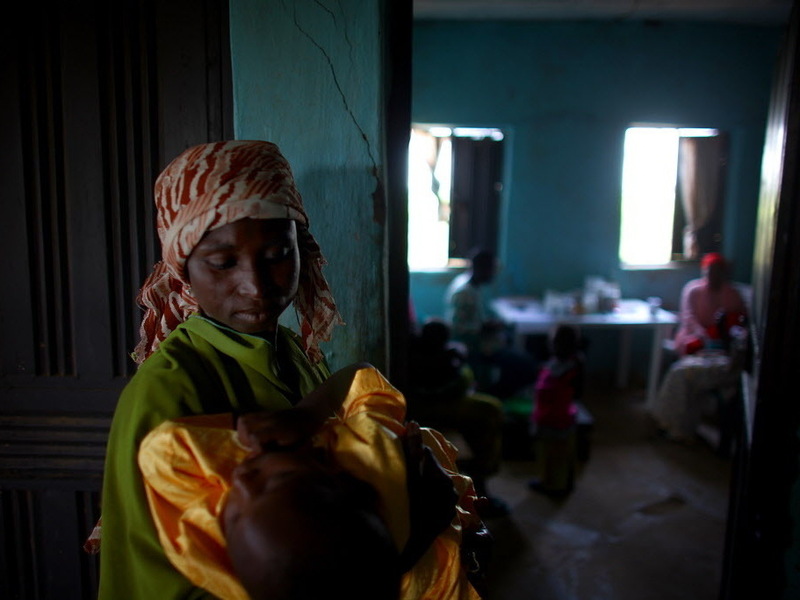 Gado Labbo holds her 5-year-old son, Yusuf, at a clinic in Dareta, Nigeria. In 2010, when Yusuf first entered the clinic, he had a blood lead level 30 times higher than the amount the Centers for Disease Control and Prevention considers dangerous. Children in northwestern Nigeria are no longer dying by the hundreds. That's the promising word from Mary Jean Brown, chief of the lead poisoning prevention program at the Centers for Disease Control and Prevention. She is a co-author of a recent assessment of the lead poisoning crisis in Nigeria. From November 2009 to May 2010, some 400 children died in the northwestern state of Zamfara. They were poisoned by lead dust released during the processing of gold ore. Doctors Without Borders called it the worst case of environmental lead poisoning in years. Brown and her colleagues reviewed subsequent efforts to eliminate the lead dust. To see if protective efforts were working, they reviewed data collected in 2012 on the level of lead in the blood of youngsters age 5 and under — with encouraging results. "The assessment found few children in need of medical treatment," the team writes in the current issue of Morbidity and Mortality Weekly Report. The original crisis was sparked by a rise in gold prices, which soared from $600 per ounce in 2006 to nearly $1,900 per ounce in 2011. (Current value is about $1,300 per ounce.) Eager to earn money, local residents began processing ore for gold. In this part of Nigeria, the ore that contains gold is also laden with lead. Many residents were extracting the gold by grinding rocks in flour grinders in their yards and homes — a process that generates clouds of lead-laden dust. The adult doing the grinding might be a mother with a baby on her back, and the child might inhale the dust that way. Or the dust ended up on the ground — and on children's hands and in their mouths. "These kids are outside playing in the dirt," Brown tells Shots. The challenge for health workers was to stem the poisoning while still enabling the community to benefit from any gold they might uncover. And Western aid groups wanted to do so in concert with Nigerian authorities. "We didn't want to be heroes jumping out of helicopters and fixing this problem," Brown says. "This is a Nigerian problem, and we knew from the beginning it had to be done by Nigerians." The CDC and Doctors Without Borders collaborated closely with government health and environmental specialists. Children under age 5, the most vulnerable to lead's dire effects, were tested for lead in their blood and treated with chelation therapy if necessary. That treatment involves injecting a chemical solution into the bloodstream that surrounds the lead "like a claw," Brown says. Then the kidneys can excrete the metal more efficiently. In other measures, contaminated sites are being cleaned up, and parents are being taught how to keep children safe. In addition, new methods of extracting gold are being explored. An education campaign, run by CDC, Doctors Without Borders and their Nigerian partners, has been successful. While 71 percent of families once processed ore in their backyards, only about 5 percent of families now do so, Brown and her colleagues found. There is still cause for concern — for the children who survived and now struggle with disabilities, and for children who might still be exposed to lead. "Thousands have severe mental retardation, blindness, spastic paralysis and development delays," Brown says. Despite the encouraging signs, the need for vigilance is constant. "Left alone," Brown warns, "we're afraid things might go back to the way they were."